The DONIC Acuda rubbers became an immediate worldwide success the moment they entered the market. In order to offer unbeatable rubber technology for the top players DONIC included Turbo in the manufacture of its bestseller Acuda S1 series. 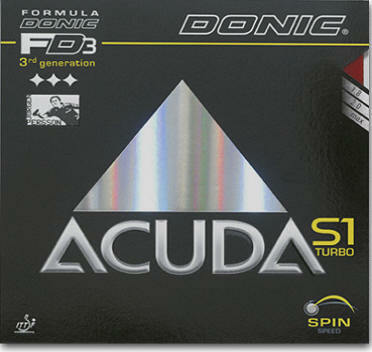 DONIC Acuda S1 Turbo is a precision rubber designed for accuracy at high speeds. Despite the rubber being dynamic and fast, it has perfect feel - reminiscent of earlier speed glue days. Thanks to highly developed technology this advanced rubber from the house of DONIC produces good length when playing fast loops and that despite a characteristic high arc.